Will the Eagles make a trade-deadline deal? Eagles executive vice president of football operations Howie Roseman has made 41 player trades in his tenure so far. The NFL's trade deadline is 4 p.m. Tuesday, and the Eagles are one of the teams that could be looking to make a deal. With the NFL's best record at 7-1, the Eagles fit the profile of a contending team that would explore opportunities to bolster its roster for the back half of the schedule. Plus, Eagles executive Howie Roseman is known as one of the most active traders in the league. "I like where we're at right now with our roster [with] the way guys are playing," coach Doug Pederson said Monday, one day after the Eagles' 33-10 win over San Francisco. "We're always looking, obviously. I'm not going to leave it out of the question, but at the same time, the guys that we have in this locker room, we've got a lot of confidence in, and we go forward from there." The NFL's trade deadline is not like that of the NBA, NHL, or Major League Baseball. Trades are less common in the NFL – especially in-season. There was only one trade last season on the day of the deadline and four total trades in the week leading up to the deadline. However, there were already two reported trades on Monday night. Roseman has made 41 player trades (not pick-for-pick deals) since he became general manager in 2010, excluding his 2015 season in exile. Of those trades, only two were made after Week 1. So even for an aggressive executive like Roseman, the in-season trade is rare. Considering the challenges of learning a scheme and developing chemistry with new teammates, it's difficult to add a significant contributor in November. It's not like a third baseman going from the Yankees to the Phillies. Plus, the Eagles lack the draft capital that would help make a trade easier to afford. They already have dealt their second-, third-, and seventh-round picks in next April's draft. However, they have three fourth-round picks, two fifth-round picks, and a sixth-round pick to give them six Day 3 picks in their cupboard. And with linebacker Jordan Hicks on the 53-man roster waiting to go on injured reserve, they have a roster spot available for a newcomer. The best argument to make a trade is that the Eagles are legitimate contenders this season, and opportunities are precious in the NFL. It's easy to look at a young Carson Wentz and expect to perennially be among the best in the NFL, but the same logic was applied to Indianapolis earlier in Andrew Luck's career. Long-term planning can be nebulous in the NFL, so it makes sense to explore ways to upgrade this roster. Injuries have limited the Eagles in key areas. After losing Darren Sproles in Week 3, the Eagles lack a reliable pass-blocking running back. Wendell Smallwood is the best they have, but with defenses dialing blitzes against the Eagles, it could make sense to check the price of players proven in that role. Veteran running back Frank Gore, who is on an expiring deal for the 2-6 Colts, could be a sensible upgrade. A blocking tight end who can line up in the backfield as a fullback would fit that profile, too. Jason Peters' injury has left the Eagles unproven at left tackle. The team is committed to Halapoulivaati Vaitai, although Seattle was aggressive in upgrading their offensive line by trading for veteran tackle Duane Brown on Monday. The price might be prohibitive for the Eagles to acquire a full-time starting tackle such as Buffalo's Cordy Glenn, and the Eagles prefer to build from within. They could be more compelled to seek a reserve with experience to bolster the depth; Isaac Seumalo and Taylor Hart are the backup tackles. Role players are often better targets during the season than every-down players because of the quick transition. Cornerback is a weakness on the Eagles' defense, but Ronald Darby will soon return from injury and Sidney Jones is a late-season possibility. They could provide the necessary upgrades. And even though the Eagles might be linked to wide receivers, they're optimistic about the development of players such as Mack Hollins and Marcus Johnson. The Eagles know they've reached 7-1 with their current roster. So standing pat could be a fine option, too, and the Eagles have seemed to discover the right mix of personalities and leadership in the locker room to foster the chemistry that the best teams boast. "That's why you have to be careful," Pederson said. "It's got to be the right fit. It can't just be anybody. From my standpoint, you don't want to disrupt the chemistry that is going on in the dressing room right now. And those guys are playing with a lot of confidence, and they're rallying around each other. So it would have to be a pretty special fit to make it work." Trade decisions are made by the front office, with Roseman and Joe Douglas at the helm. Dwayne Joseph, the pro scouting director, would be a key figure when identifying a player from a different roster. The coaching staff's focus is on players already on the roster and putting together a game plan for Sunday's game against the Denver Broncos. They're available for feedback but do not make the personnel decisions. Roseman is the man in charge at the trade deadline. "We are focused on Denver and getting Denver in here," Pederson said. "I can't worry myself sometimes on things that are a little bit out of my control at this point. … If there is somebody that's [of] interest, then yeah, we'll have that conversation. We'll cross that bridge when we can, obviously, a short period of time." 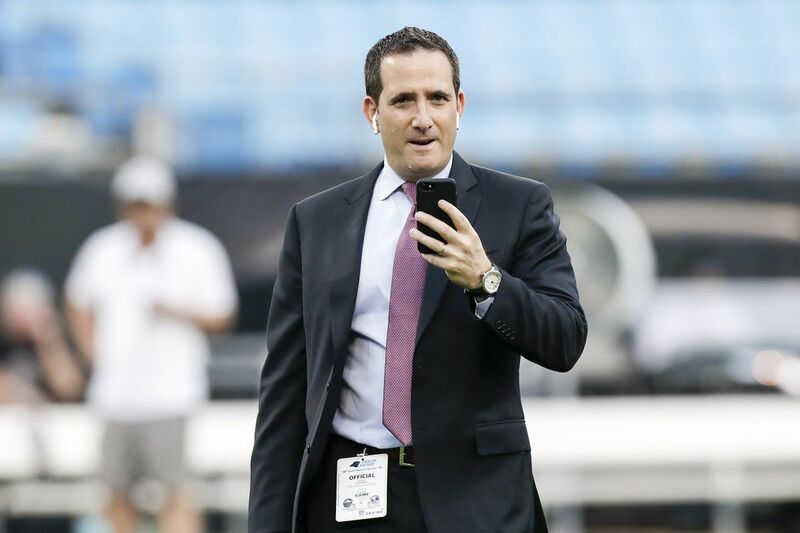 Howie Roseman has made 41 trades of players since his 2010 promotion to general manager, excluding 2015 when he was not involved in personnel decisions. These trades do not include pick-for-pick deals.